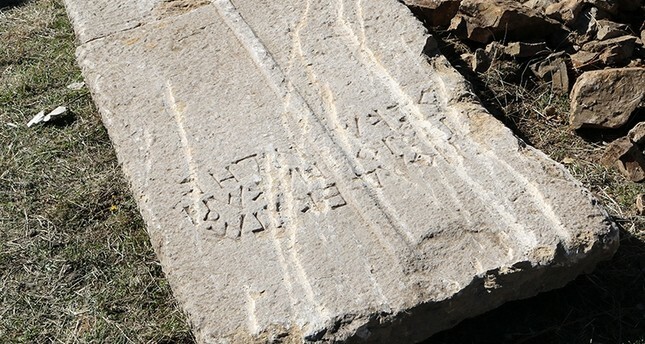 Workers renovating the power distribution unit in Turkey's northeastern Gümüşhane province discovered a 1,407-year-old Byzantine sarcophagus cover, assumed to belong to a "blessed" figure, near the ancient city of Satala, reports said Friday. Workers immediately informed authorities after discovering the 2-meter long ancient cover in Gümüşhane's Kelkit district, Anadolu Agency reported. Gümüşhane Museum officials said that there was a writing on the cover, saying "Blessed Kandes sleeps here" in Greek characters. Museum Director Gamze Demir told reporters that the cover is from 610 AD and the sarcophagus is believed to be under the ground. "The discovery of the full sarcophagus will give us a clue about who it was built for" Demir said. She continued by adding that there are houses near the site where the cover was found, indicating that the excavation site could be widened to cover a larger area. Demir also noted that the village has been under protection of the Culture and Tourism Ministry since 1998 and carrying out excavations without the permission of museum officials is prohibited. Meanwhile, Professor Şahin Yıldırım from Bartın University's Archaeology Department said that archaeological excavations need to be carried out near the site where the sarcophagus cover was discovered. He highlighted that researchers should try to figure out if the site around the sarcophagus was a necropolis. "If it [the area] was a necropolis, there must have been an important structure near it" Yıldırım said, adding that there could have been a church near the area. Located in the village of Sadak, Satala was an important military camp of the Byzantine Empire. The Hittites, Persians, Romans, Pontic Greeks, Urartu and Byzantines ruled over the area.